It's getting colder each day here in NY and I plan on riding until they start salting the roads. 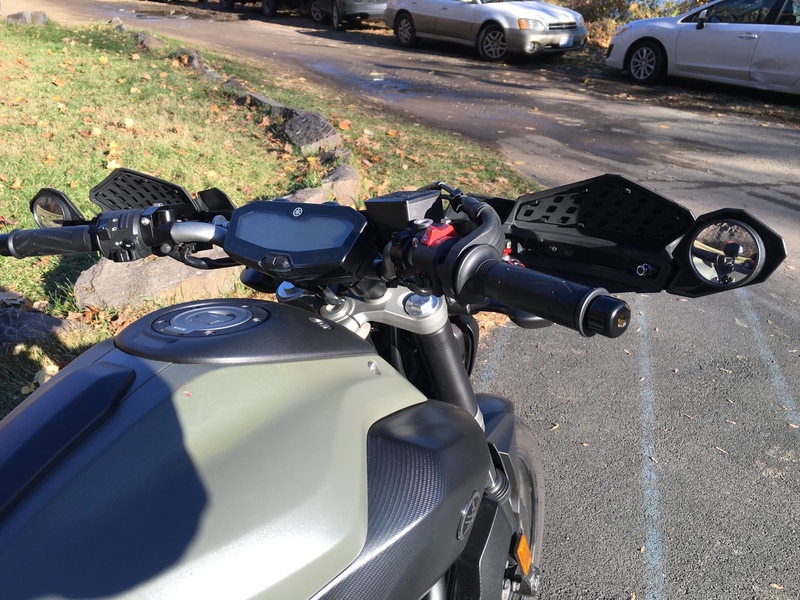 To help keep my hands warm I've opted for hand guards (but I'm close to getting grip warmers) and was able to find a solution that would give me bar end type mirror. I opted for the slightly cleaner looking "Star" model from Powermadd vs their "Sentinal" model. COST - $53.91 shipped for just the hand guards and moto mounting kit via Hurley Motorsports on eBay, which was the best deal I found. On Amazon I found an open box deal on the mirror kit for $16 shipped, usually it runs $20 - Hey, every dollar counts. These mirrors are definitely tiny, but for the most part they do give usable visibility. The only thing I can't tell is if there's a cop coming up behind me. I also ordered the larger mirror kit which I have yet to install, but the smaller mirrors definitely look nicer. 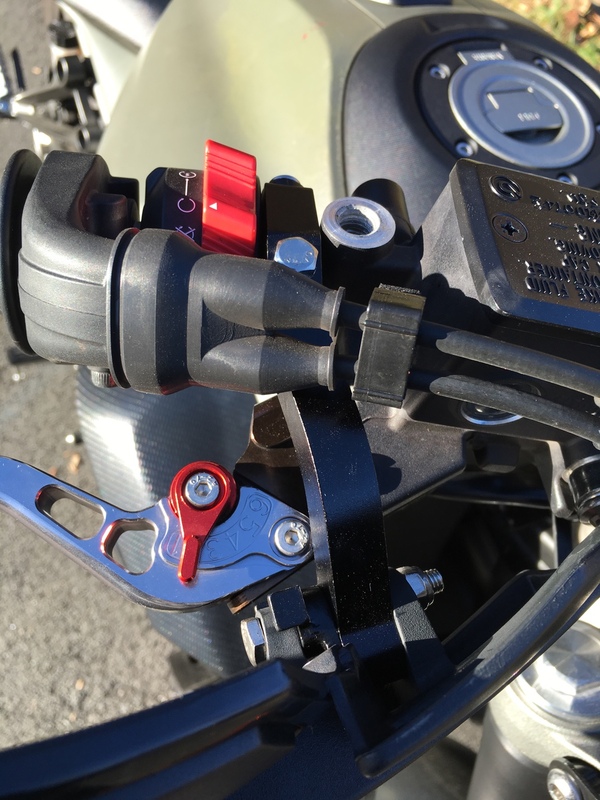 Having said that, it's not the best looking hand guard/bar end mirror setup, but functionality wise they do the job. 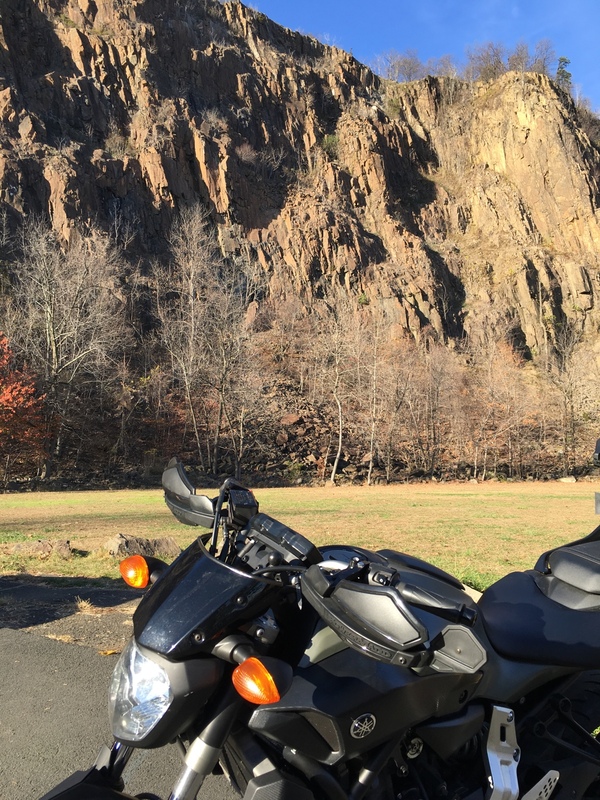 My hands stayed warmer a bit longer at highway speeds and the bike is more streamlined without the stock mirrors. To my surprise there is not much vibration even though it's just one mounting point. 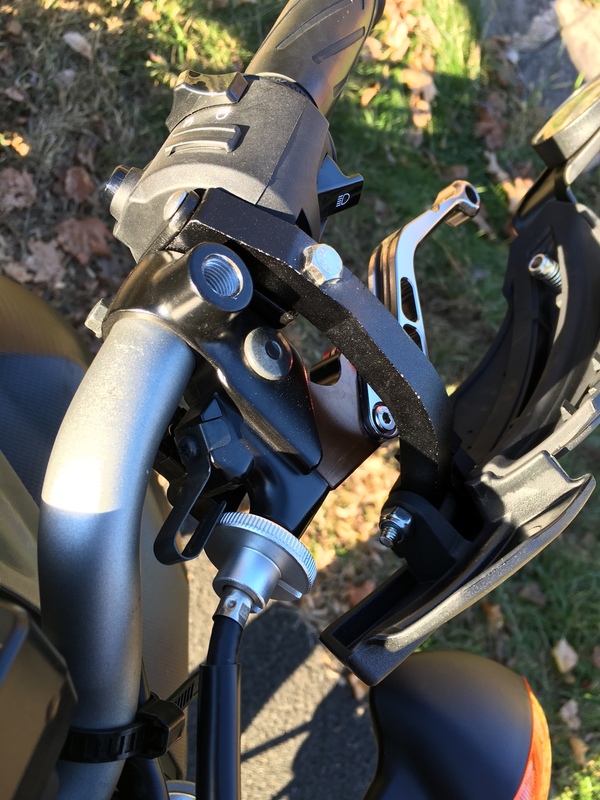 They do offer an additional hand wrap bracket connecting the hand guards to the bar ends. Installation was easier than I thought. I moved both the clutch and brake levers over a bit to make room. 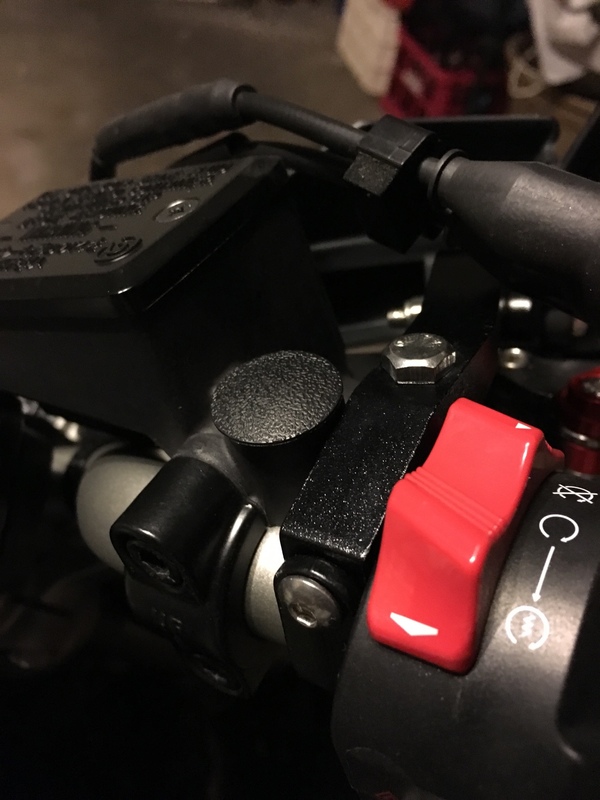 I may shave off the part of the brake lever mount where the mirrors used to screw into so I can move the levers back out an extra centimeter. I used some Nissan plastic clips from Lowe's to plug the empty screw mounts left by the original mirrors. In my opinion the overall design work by PowerMadd is not great, but this product is also relatively cheap compared to similar products from other companies. These hand guards were also originally designed for dirt bikes and snowmobiles and it shows with it's style and visible bolt ends/nuts. 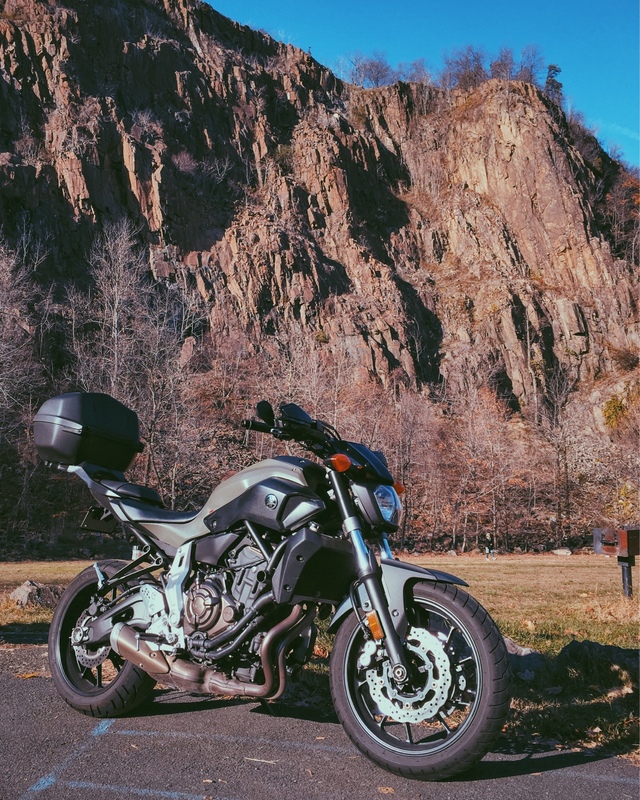 Yamaha did such a great job with the FZ-07 design and I feel these do not fully live up to those standards, but PowerMadd solved 2 issues I was having (cold hands and ugly mirrors) and I tend to lean more towards function vs form. From the quick research I did, there aren't many options for bar-end type mirrors and hand guards. Combining the two in one product seems obvious to me and I was happy to find that PowerMadd had just the thing at a very low cost. Sweet! I didn't know they had mirror mounts like that. I'll probably just keep my regular bar ends though. I have been riding here in WA in 34-40 degree temps and with my stupid astronaut-looking suit I am completely warm except for my hands. My question is, how well would you say it solved the cold hand problem? Do you still feel it after a while or could you go a few hours without getting cold fingers? Those look pretty good. I might spring for the bar end braces, they're only $45 extra and all together come out cheaper than a lot of the other handguard sets out there. I think these are definitely the cheapest option for hand guards. Acerbis has nicer looking options but they are about double the total price, and you don't get mirrors. It definitely helps, but with the gloves I have (Alpinestars Yari Drystar) my hands still got a bit cold after a 30 mins of riding at speed. It didn't get unbearable, but it was also only about 50f and sunny outside. I'd rather not go the heated glove route, so I'll probably end up getting grip warmers as well. With heated coming form the grips and wind being blocked there's no doubt your hands will be comfortable into the 30s. It was also mentioned the Oxford Heaterz scooter version has a very small controller as well, but it seems to be out of stock everywhere in the US. It's also the cheapest. I took a closer look and I goofed, I didn't realize that all their stuff was a la carte. Had to get each bit separately (mount, handguard, end brace) and I hadn't taken the mount into my final price so that bumped it up. All told it came to just over $100, which is the same as what the Zeta Racing bits go for, and with them you get a solid metal brace that protects your controls and hands. I looked at the Zetas as well but actually preferred the look of the powermadd Stars a bit more. Also, no mirror option with Zeta, but they do have LED signal kits. So... I guess these would these work? Mainly considering these to mantain the bar end mirrors. I like the hand guards but not the mirrors if they aren't convex, to give a wider view than standard mirrors. If they aren't convex I would rather have some good CRG Lane Splitters than those. You could see cops behind you and to the side at the same time. Looks nice, still. Yep, got the Rizoma Reverse Retro in black, you can actually see well through them but they are just slightly smaller than the OEM ones. Cannot beat them in price and I believe they can more or less match the aesthetics of the FZ. At night, after the sun has maybe warmed up the air, at 32 it was enough for my commute back home (city (speed) and at 45 mph over a bridge). I believe that avoiding the wind directly to my hands with these hand guards should be enough. Bear in mind I am using a Dainese silk underglove & a pair of Garibaldi gloves with Thinsulate for winter.